Close your eyes for a moment and picture the coastal rainforest of the Pacific Northwest. Emerald greens surround you as waves break in the distance. You feel yourself melt into the soft moss beneath you as your mind moves upwards and outwards towards the tree tops and stars. Your body feels lighter and so does your mood. Let nature hold you for a minute or two. A huge comfort to me is time spent outside. The crashing coast, the rainy woods, there’s something that glows about the rainforests of the Pacific Northwest. When I moved closer to the coast, I thought I would soon tire of the rain, but instead I came to love it. When you’re comfortable and dry under layers of long underwear and rain jackets, feeling the raindrops tapping on your shoulders is a constant reminder of both your separation from and your place in that glittering wet word. Those rainforests are magical in another way, too - some of the most healing herbs and plants grow tucked underneath those green canopies. From seaweeds to mushrooms, roots to berries, the coastal rainforest is a cornucopia of healing. ‘Healing’ is such a broad word, with as many definitions as there are people who use it. When I think of healing, I think of releasing past traumas, supporting my body as it fights disease, and learning to be a little bit kinder to myself, on good days and bad. Sometimes that means spending a quiet afternoon in the kitchen carefully creating an elaborate dessert to share with friends. Sometimes that means curling up on the couch and letting a few responsibilities slip off my plate. And sometimes that means leaving everything else behind me and heading into the wild. In all of these examples, having a simple and easy-to-prepare pot of nourishing food waiting for me is a huge comfort. Even better when it’s infused with some of those magical fungi and seaweeds gathered from my favorite places! First, let’s talk about congee. If you haven’t heard of it, it’s a slow-cooked rice dish made all over Asia (also going by the names ‘juk’ and ‘jook’.) A long, gentle cooking breaks down the starch in the rice grains, creating a creamy porridge similar to risotto. A crock pot does all the work for you, making it an ideal comfort food for days that you just don’t have the energy to stand over the stove for an hour or two. The broken-down starches of rice make it extra digestible too! Added to that is the comfort food classic, chicken broth. Broths are used in cultures all over the world to nourish tired or sick bodies. From the American classic chicken noodle soup to Vietnamese pho to Ukranian borscht, our broth-based soups are comfort itself. Broths help heal stomach irritations and soothe inflamed throats. Plus, they’re super cozy. You can use homemade broth in this recipe, but store bought works as well. Let’s look to the coast for our next couple of special ingredients. Seaweed is particularly wholesome, especially for anyone struggling with thyroid imbalances. It contains a high level of natural iodine, which binds to the iodine receptors in our bodies so we pick up less of the bad kinds of iodine. 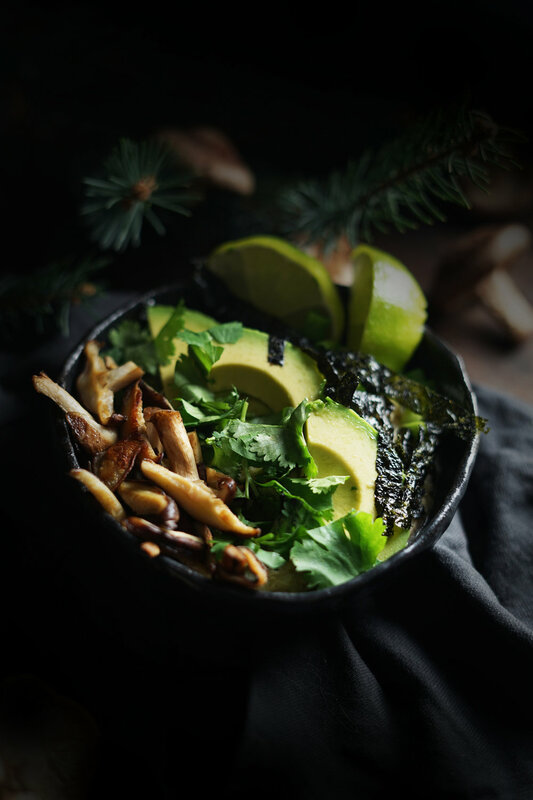 Seaweed is also particularly high in nutrients, especially magnesium, potassium, and zinc, which help to relax your body and support your immune system. It also gives dishes a rich umami taste, deepening the richness of both savory and sweet foods. Growing just off the coast are the mushrooms. This recipe uses dried shiitake, but you could certainly substitute your favorite foraged mushrooms instead, fresh or dried. (Buttery boletes would be particularly lovely!) Mushrooms play a very unique role in the immune system of the body. While they’re not known to be aggressive at fighting disease, they instead act as scanners in your body, alerting your immune system of any problems so it can fight them itself. That’s part of the reason certain kinds of mushrooms are being studied so deeply for cancer treatments right now! Mushrooms are also high in rejuvenating B-vitamins, and contain all eight essential amino acids, which is unusual for a non-animal source. They’re an excellent source of both protein and vitamins. Next up comes cilantro, which is a natural chelator. That means it binds to heavy metals in your system and helps your body to excrete them. As part of my Lyme treatment, I take a medication that serves the same purpose, but I also eat cilantro on those days as some studies have shown that it greatly improves the efficiency of the drug. It’s a great herb to incorporate into your diet for many reasons (not least of which is that fresh flavor!) but this property is a big part of the appeal for me. Last up, there’s the avocado, silky and creamy and full of lots of good fats and fiber. Our bodies need those healthy monounsaturated fatty acids to function properly. The oleic acid in particular has been associated with reduced inflammation. The soluble and unsoluble fiber in avocados is also linked to heart health. Avocados are also very high in potassium (more than bananas, in fact!) which helps to support healthy blood pressure levels and prevents muscle cramping. So whip up this ridiculously easy dinner on a day when you need a little comfort and coziness and enjoy it, knowing that it is giving your body all kinds of good things. Let the coastal comforts fill you. Bring the chicken stock to a boil, then remove from heat and add the mushrooms and kombu. Let sit for 30-35 minutes, then scoop the mushrooms and seaweed out and set aside in the fridge. Add the stock to a crock pot along with the rice, ginger, star anise, sea salt, chicken breasts, and seaweed. Cover and cook on low for 8 hours. Remove the chicken and let cool until you can handle it. Remove the skin and bones and discard, then shred the remaining meat and add it back to the pot. Turn the heat up to high and cook for another half hour, or until the mixture has thickened to your liking. Meanwhile, heat a frying pan over medium heat and add the olive oil. Pat the reconstituted mushrooms dry, then sauté them until slightly browned and fragrant. To serve, ladle the congee into a bowl and top with the cooked mushrooms, green onions, avocado, cilantro, and optional sriracha chili sauce, sesame seeds, and a squirt of lime. Love what you’ve read here? Don’t forget to Subscribe to get frequent updates of new posts!